Leading climate expert Fatima Denton called for a new narrative on Africa and climate change when she delivered the 2014 Barbara Ward lecture. She said that despite its problems, Africa has "limitless potential" to win the fight against climate change. Fatima Denton is leader of the African Climate Policy Centre of the UN Economic Commission for Africa (UNECA). She heads UNECA's Special Initiatives Division and is an internationally known expert in the field of climate change adaptation and policy development. She is a lead author for the Intergovernmental Panel on Climate Change. Denton was speaking at the 2014 Barbara Ward Lecture at the British Library in London. 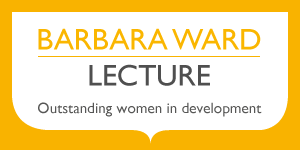 The Barbara Ward Lecture series celebrates IIED's founder and honours outstanding women in development. Denton said: "As the world prepares itself for a successor treaty to the Kyoto Protocol in Paris 2015, it is time to rewrite the narrative of Africa and climate change." She said that after years of seeing its natural resources exploited and of being on the periphery of international negotiations, the time had come for Africa to seize climate change as a business opportunity. She said that climate change could be an opportunity that could bring sustained growth, new technologies and job creation. Denton entitled her address: Rewriting the narrative on Africa and climate change – a case of "standing knee deep in the river and dying of thirst". The continent was battling against climate change impacts, as evidenced through agricultural losses amounting to 2-7 per cent of GDP. Denton said Africa needed to seek new avenues for low carbon, innovative growth. A low carbon growth trajectory featuring new technological and economic processes could augment Africa's current primary sector based growth. Denton said: "What I am proposing is a new paradigm of development for Africa." She said: "This new narrative needs to be written that understands the finite nature of natural resources and, as custodian of so much of the world's potential raw materials, husbands them better for the benefit of the whole world, while engineering its pathway to sustainable development, particularly in the domain of food production and security." She said that in order to achieve this new trajectory, Africa's governance landscape would need to change. The scale and urgency of the climate challenge meant that although the state would play a central role in developing responses, the policy space would need enlarging to accommodate other actors. Denton said addressing climate change would need "a complex web of multilateral and bilateral mechanisms". These in turn depended on "a properly functional and capacitated state, with appropriate national and sub-national institutions". She said privatisation had led to the state withdrawing from many sectors where climate adaption would be key. A new narrative on climate change would reinforce the need for public-private partnerships. "Climate change governance in Africa calls for renewed public engagement in formulating national responses, a review of the quality of growth and development processes, and greater emphasis on equity." she added. Denton said foregn direct investment and market expansion for climate governance raised further governance issues: "A key governance question is: how can the capacities of the African state, and by extension regional institutions, be strengthened and connected to sub-national levels where adaptation takes shape, to ensure the emergence of a robust climate governance framework that supports African Development?". Denton said that in the past Africa had found it difficult to make its case in key climate negotiations and had been frustrated by the "woefully slow pace" of talks. Today, African countries such as Ethiopia, Mozambique and Benin were taking a lead in climate action. She noted that some critics were calling for for an alternative space where the most progressive African countries could pool their resources and make swifter progress. She said: "These climate champions can engage with each other using a fast lane to address issues that are at the intersection of human security and development." Denton said leveraging the continent's agriculture sector was critical, given Africa's growing population. Agriculture employed about 70-75 per cent of the African population. Yet agricultural productivity, averaging around 1.5 tonnes per hectare, remained the lowest in the world. She said the agricultural sector needed to be capitalised as an engine for propelling economic growth and transformation. Climate change could be the spur for doing this. Some countries were already moving towards integrating climate change strategies into projects to increase food production. Uganda had been able to use the fact that it was a low user of artifical fertilizers to build exports of organic foods. It had increased certified organic exports from $3.7 million USD to $22.8 million in less than four years. Denton said that Africa's current energy supply was characterised by unpredictable and insecure power sources. With the strong correlation between economic growth and energy consumption, Africa needed to move towards sustainable and renewable sources of energy – an area where Africa had huge potential. It would be important to create private investor confidence in the sector. This could be done by setting clear goals and establishing dedicated and authorised agencies responsible for promoting, initiating and financing renewable energy projects by African governments. She said governments could stimulate private investment in renewables by guaranteeing the purchase of electricity from renewable energy sources at a predetermined attractive price. Feed-in tariffs could also be used an effective policy instrument to stimulate investment in renewable energy generation, through offering long-term contracts to renewable energy producers. Denton said Africa should also invest in its young people. The number of Africans under 18 was expected to reach almost one billion by 2050. The continent had a ready-made, energetic, youthful workfoce. It was crucial to invest in the right skills, training, and access to technology. Denton said technology was the propellant that enabled wealth creation. Innovation was already under way: Rwanda had revolutionised its information and communications technology sector, and demonstrated that it was possible to leap-frog dirty and inefficient technologies and products. In some countries, climate science and information services were becoming transformative tools for African farmers. The Climate for Development in Africa (ClimDev-Africa) Programme would shortly be launching a $1m fellowship programme to for young climate scientists. Denton concluded her lecture by saying that Africa's tremendous resources, if properly coordinated, offered a unique set of chances to overcome the challenges of climate change and turn risks into development opportunities. She said: "We must seize the opportunity for international cooperation to produce a strong enough current that will “lift all the boats." The 2014 Barbara Ward Lecture was attended by policy-makers, researchers and academics, and Denton's lecture was followed by a lively question and answer session. We published a round-up of the lecture and the discussion via Storify. 2012: Christiana Figueres calls for an "energy revolution"